There are huge opportunities for investors right across the continent, with CEE offering perhaps the greatest scope for substantial returns. But a market growing at the kind of pace seen in European logistics carries threats as well as opportunities and needs a degree of insight if investors are to maximize returns. Across Europe, the industrial real estate market is in boom mode. There is under-supply and over-demand across the board, and this is reflected in rising rents and increasingly healthy returns for investors. According to JLL, warehouse take-up in Europe was up 3 percent in H1 2018, compared with the same period last year, while the estimated average vacancy rate falling below 5 percent during the second quarter of the year. Ian Worboys, chief executive of P3 Logistics Parks, which operates in eight European jurisdictions, confirms that the vacancy rate for industrial properties is "extremely low" across most of the areas in which his company operates. He comments: "Apart from France, vacancy is at around two to three months of supply, which is why you are seeing rents go up. 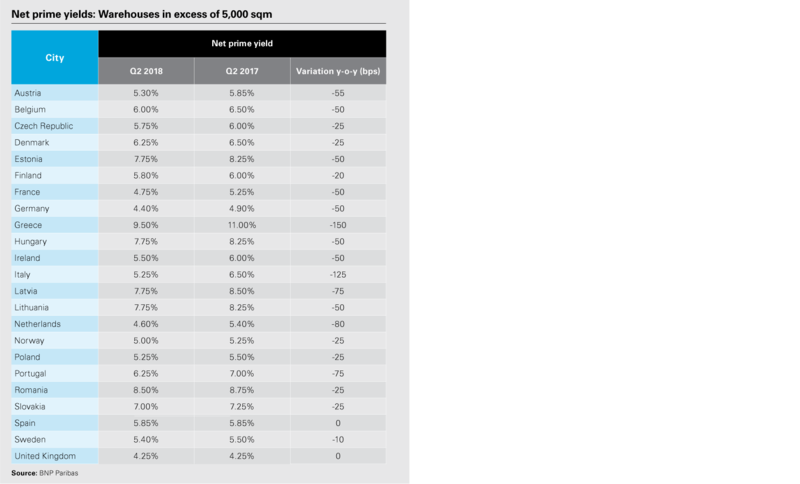 For investors, yields are getting lower, so values are going up." According to BNP Paribas, vacancy rates for large units are at their lowest in Spain, the Netherlands, Poland and the Czech Republic. The latter two jurisdictions have the most constrained supply, with vacancy rates in each averaging 3.8 percent in the first six months of the year. Over the long haul, the lack of supply has had a relatively modest impact on rents, which have increased by a little over 8 percent in the past five years. However, BNP Paribas notes a 2 percent rise in rents in H1 2018 in the main European markets, with more sizeable growth seen in Milan, Berlin and some UK regional cities. E-commerce appears to be a major driver for much of the growth in occupier demand. JLL found that demand for e-fulfillment space was up 68 percent in H1 2018, year–on–year. 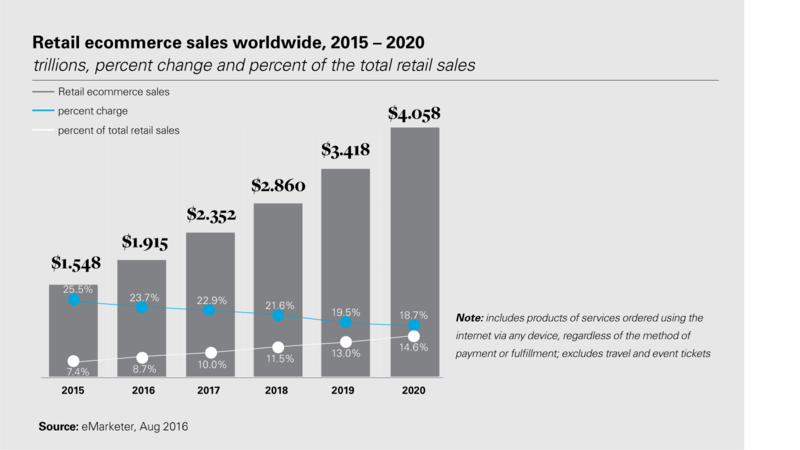 As the e-commerce sector continues to exert an influence, we are likely to see greater cannibalization, with online retailers expanding into traditional store retailer spaces and High Street retailers growing their e-commerce ventures. When it comes to investment in logistics and industrial, 2019 has so far continued the recent trend of seeing increasing interest in the sector from a range of investors. According to JLL, there were €12.3 billion worth of deals transacted on European logistics and industrial assets in H1 2018. While this was down from the exceptionally high H1 2017 figure, it was 25 percent higher during the same period in 2016 and 48 percent higher than the five-year average. As Prologis's European president Ben Bannatyne explains, logistics real estate is viewed as a "value driver" rather than a "cost factor". "From a capital markets perspective, lower cap rates and core return requirements change the development equation, creating a tailwind for rental growth," he adds. "All this combined with reduced land availability, particularly in infill locations, is setting the engines of growth in motion for the long run." 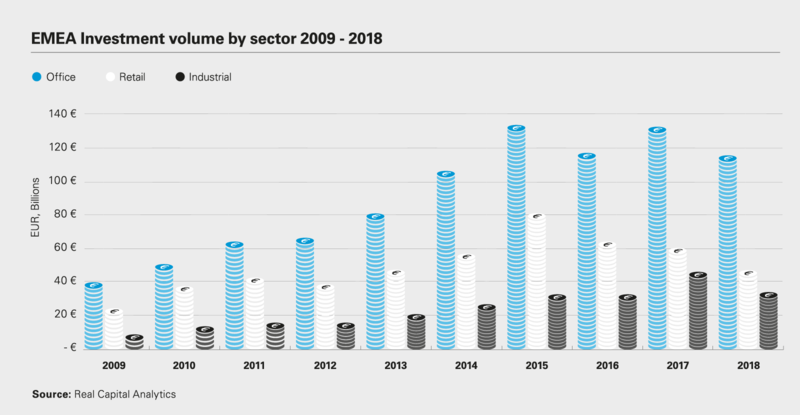 Active investors in the sector are coming increasingly from Asia- Pacific and North America, including from sovereign wealth funds and institutional backers. As P3's Worboys comments: "Compared to ten years ago, we are seeing much more outward investment from the Koreans, the Chinese and the Japanese, while the amount of funding from pension funds in Canada is quite incredible." An indicator of the recent interest from non-European institutional investors in the logistics market came with the 2016 purchase of P3 itself by Singapore sovereign wealth fund GIC for €2.4 billion—the largest European real estate deal of any kind that year. Although there are still ample opportunities in western Europe, particularly in facilities close to large population centers, many in the sector see the most untapped potential in the so-called CEE-6 markets of Poland, Czech Republic, Slovakia, Hungary, Romania and Bulgaria. Colliers International predicts that there will be a requirement for more than one million square meters of new logistics and distribution space in these markets combined per year between 2018 and 2022. That equates to approximately 5 percent of present stock. The firm’s more optimistic "high scenario" forecast has that figure at 1.327 million square meters of additional space per annum. That level of requirement would absorb all current construction activity in the industrial sector in the Czech Republic, Slovakia and Hungary, and nearly all activity in Romania. Developers are starting to respond to this new surge of demand in the CEE region. According to figures from Cushman & Wakefield, 2017 saw the total supply of industrial stock in the CEE-6 (stripping out Bulgaria) exceed the previous peak years of 2007 and 2008. Growth in Poland has been particularly dramatic, boosted by proximity to German markets and closer integration with EU supply chains. Overall supply of industrial space in Poland in 2017 was nearly double that of 2016 (2.3 million square meters vs. 1.2 million square meters). The Polish market has also been boosted by a wave of major projects from large occupiers, including Amazon, H&M and Zalando. Romania, meanwhile, now has almost 500,000 square meters of supply from a virtual standing start just two years ago. Again, improved infrastructure has played a major role here, with a major modern road building program well underway in the country. Yet mirroring a broader trend across Europe, vacancy rates in these jurisdictions are falling rapidly. Having been in double figures in Poland, Hungary and Romania five years ago, they are currently sitting at between 4 and 6 percent across the region. This scenario is likely to see the rebirth of speculative development, which had ground to a halt in the first half of the decade. "Prior to 2008/09 (pre-crisis) there was a lot of speculative development and then it just stopped because vacancies were high and new tenants entering the market considerably slowed down," explains Harry Bannatyne, a partner in Colliers’ logistics team, based in Prague. "At that point it was about filling the available space. But developers have started to speculatively develop again as demand is outstripping supply." As the sector has grown, it has also consolidated. Major developers in Europe—particularly P3, Prologis and CTP—have expanded their portfolios in recent years as a reaction to the demands of a new type of mega-occupier, typified by Amazon, which requires ever–larger and more flexible fulfillment centers. Consolidation and expansion have been achieved through different routes. GIC's purchase of P3, for example, has given it the financial muscle to expand in a number of regions, both through M&A activity and its own development. In the two years since the deal, it has expanded its rentable portfolio in Europe to nearly 4 million square meters and completed the acquisition of an 11-warehouse portfolio in Spain. Prologis, which operates in 12 European jurisdictions, has been gradually building its stock through a series of small acquisitions, growing its footprint on the continent from 14.3 million square meters to 17 million square meters over the last three years. CTP Logistics, which is privately owned, has been steadily consolidating in its core areas of Czech Republic, Slovakia, Hungary and Romania, building a land bank that will allow it to grow its leasable portfolio from 3 million square meters to 5 million square meters. As the company's portfolio expands, however, it is—like other developers— looking for cost–saving opportunities. Richard Wilkinson, CFO at CTP, says that investing in energy efficiency and "smart" commercial buildings is an increasingly important part of his strategy: "The numbers vary, but energy consumption and building operations are typically 20 to 30 percent of costs for real estate developers and managers— that’s a lot of money out the door and a significant hit to the environment. It’s also loaded with waste, waste that can be at least partially eliminated with the help of relatively cheap technologies. So, for us and our clients, as were’re both developers and managers, ensuring that our buildings are on the leading edge of IoT is without question. The cost savings, in both energy and space utilization are huge." The maxim of "location, location, location" is increasingly set to apply to the logistics sector, as e-commerce businesses such as Amazon prioritize the so-called "last mile" delivery process. That means warehouse developers and their investors are engaging with a new set of potential occupiers, whether its bespoke third-party logistics (3PL) providers or an Amazon-style business taking on the service for themselves. This means that distribution centers close to cities and transport hubs will carry a premium, but developers will need to be aware of local conditions, particularly when it comes to planning regimes. "It needs to be locally set up, because every city will have a different pattern and different infrastructure," agrees Ferdinand Hlobil, head of industrial for CEE at Cushman & Wakefield. "There is vast potential here for new, flexible approaches. Whoever sets it up properly might really make lots of money out of it." The potential from an investor's point of view is clearly there, with at least one recent urban logistics transaction in London priced higher than a similar residential project. 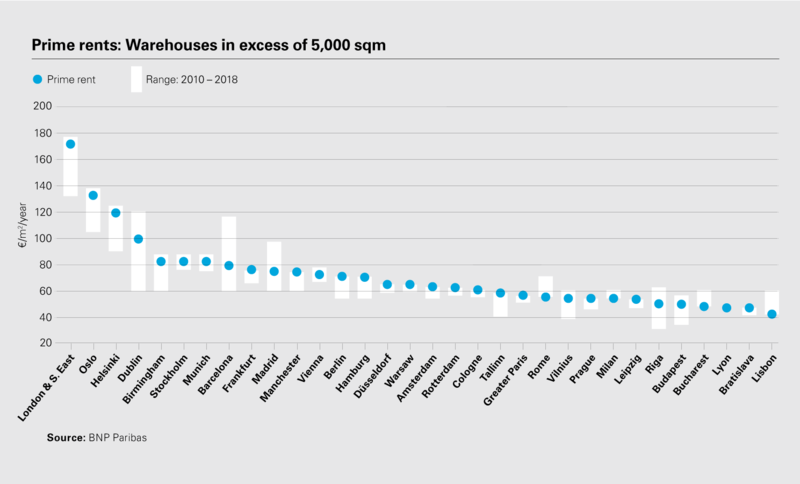 Prologis's Bannatyne says: "Land shortages in urban locations and demand for last–mile delivery facilities widens the disconnect between supply and demand. Infill becomes more infill, giving way to multi-level and multi-story approaches in high–density metropolitan markets like Paris or London. "Part of our long–term investment strategy is therefore to ensure a pristine portfolio of high-quality assets, located in the world’s busiest and most vibrant consumption centers." The increased automation of delivery and work in fulfillment centers will also change occupiers' needs. Developers have already started building more flexible warehousing spaces, with elevations reaching as high as 12 meters. Developments such as these are likely to add costs but could also strengthen returns. The potential impact of Brexit on the logistics and industrial sector is still unknown but has so far been relatively benign. For CEE developers, it could have a positive effect, with some occupiers looking to grow in markets with easier access to Germany, France and the rest of Western Europe. However, the potential for a global trade war is making some investors nervous, with fears of a Europe-wide recession if import duties and tariffs are increased by either the US or China. For developers, there is also the much more immediate effect of rising costs. The combination of increasing demand and a shortage of skilled labor in some jurisdictions is seeing construction costs skyrocket. Depending on local circumstances, construction costs across Europe are estimated to be rising at somewhere between 5 and 15 percent.